Today is my mom’s birthday, so in honor of that I thought I’d post a recipe on Wednesday instead of Sunday. Have I really not made this dish since we moved into the house and I started this blog? This really is the first thing I learned to cook on my own. 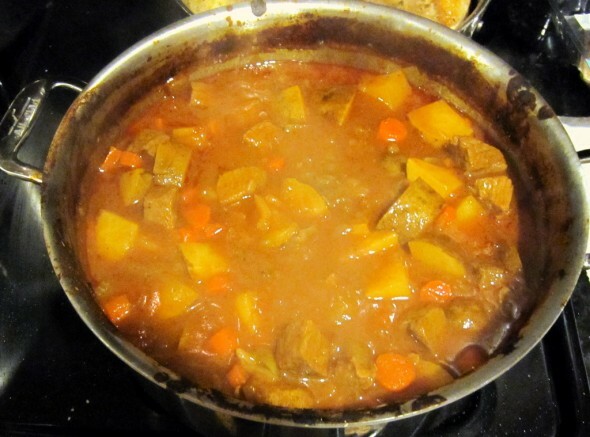 In college (dear god, that was 10 years ago now) I would often make a big pot of beef stew for my art school buddies, who would show up at my apartment on Friday nights to feast and play drinking games to bad movies. My mom taught me this recipe because you can feed a crowd heartily and for cheap, it’s one of her originals. I don’t know why, but I never thought my guy friends were eating well enough so I decided I needed to feed them. Maybe it’s because one of them lived on a diet of Coca-Cola alone. It’s also the first thing I ever cooked for Adam when we started dating 8 years ago, I was trying to impress him with my cookery. I have to laugh now, because I still didn’t know how to make anything but this. I made it in my crockpot, duct taped the lid on so it wouldn’t spill, put it on the floor of my lemon yellow VW Beetle, and drove it to his apartment in Manhattan. Is it any wonder he fell in love with me? Anyway, this really is a kitchen sink kind of dinner. You can make as much or as little as you want, with whatever veggies you want, just cook it as long as you can to get the meat fork tender. You can add wine, you can make it with tomato sauce or just beef broth, it really is open to improv. This was one of the dishes I made last week during my pre-baby cooking marathon, because it’s also one of those dishes that gets more awesome when it’s reheated. Here’s the How To for this dish, it deserved its own page. Thanks for the shout out Babe. Nice to know that you still love this dish.